While the old ship still looked good to the viewers along the river bank, everyone knew that time for the historic ship had run out. At just 428 feet in length, she was relatively small in comparison to the big 700-foot to 1,000-foot carriers that replaced her. Launched by the Cleveland Shipbuilding Company in Cleveland in 1898, the vessel was first named Presque Isle. Records show that it was painted in the colors of her first owner, the Cleveland Cliffs Transportation Company. And its first mission was to carry iron ore and coal on trips up and back down the lakes. 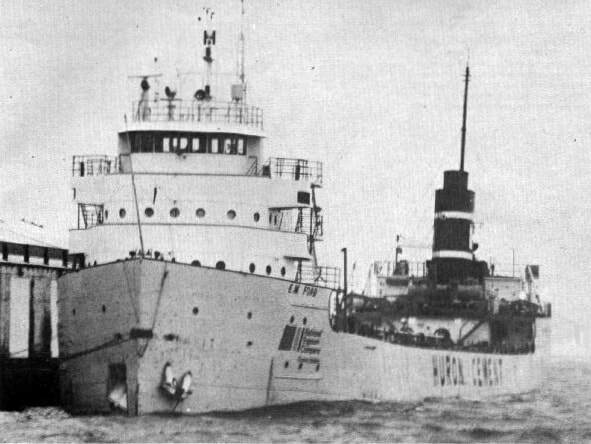 The little freighter was unique among the company’s ore carriers. It was known for its unique three-stories-high pilot house. That part of the vessel housed steering quarters, the captain’s quarters, and guest quarters with patio doors opening to a forward galley designed just for guest passengers. It was powered by a 1,500-horsepower, quadruple-expansion steam engine. Some said she had a power similar to the engine that drove the Titanic in its day. It was in 1956 that the Presque Isle was replaced by the larger ore carriers. The ship was sold to the Huron Portland Cement Co. of Alpena. That was the year it was converted to be a self-unloading cement carrier and rechristened the E. M. Ford. It was named after Emory Moran Ford, then chairman of the cement company. There were some hard luck years for the Ford. The same year it began service as a cement hauler she collided with the stone carrier A. M. Byers near Harsen’s Island on the St. Clair River. Both ships went through extensive repairs and were returned to service. Shortly after that the Ford’s boilers were converted to burn oil instead of coal. The old ship was sunk at Milwaukee in a Christmas Eve storm in 1979 after the forward bow and stern were punctured. She was carrying cement at the time. In order to save the Ford, workers had to chip away 5,850 tons of cement that flooded and set, walling off the cargo hold. They successfully raised and rebuilt the aging freighter at Sturgeon Bay, Wisconsin. In 1990 Inland Lakes Transportation took ownership of the Ford and the other boats owned by Huron Portland. The Ford was considered obsolete but instead of scrapping it that year, the old boat was moored at the Carrollton Township dock on the Saginaw River for use as a storage and transfer barge for the LaFarge North America Cement Co. The Ford’s days were numbered, however. She stood empty for several years before the decision was made to scrap her. A local historical group had been working to open a museum in the Bay City area and members lamented the fact that they failed to acquire the Ford, or even the engine before the scrapping. When last seen, the Ford was under tow by the tugs Avenger IV and Gregory J. Busch, headed down the Saginaw River and then out on Saginaw Bay on its way to the Ontario scrap yard. A century of Great Lakes history went with her.